Want to work for yourself, but can’t think of an idea? 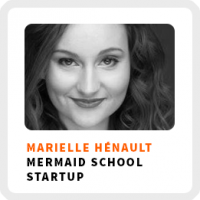 Marielle Chartier Hénault says get business ideas from what you enjoying doing. She’s the founder of Aqua Mermaid, a mermaid swimming school with 10 locations throughout North America. After getting laid off as an executive for a telecom company in Montreal, she decided to focus on her passions to find a business idea. How a photo shoot and a YouTube video sparked her business idea. How free coverage on a local radio station launched her business. How continuous feedback from her customers grew her business. How her primary business created a secondary business for her. Wake up time: Around 8:30-9:00am. Core work activities + habits: 1) Contact media outlets and get coverage. 2) Coach all of the staff that run the pools and classes. 3) Working on social media and producing content. Definition of success: To keep moving forward and keep the business growing through always taking action. Regains focus by: Working through her to-do list. To-Do List Philosophies: Listing the most urgent items at the top and then prioritizing based on financial return. If items don’t have a monetary value, try to find a way to monetize them. Sometimes, it’s helpful to ask others how they think you should prioritize. 90-day goal: Open two new schools in the U.S. When you have your idea and initial concept for your business, Marielle suggests these rule for reaching out to media outlets. 1) Make them feel special. Don’t send out the same, form email to everyone you find. 2) Customize your story to fit into their normal scope of coverage. 3) Don’t ask for things, try to give something to start the relationship. Interview With Marelle’s boyfriend Liam Martin on personal productivity.